We've closely worked with Casio since they launched their first Android Wear smartwatch in 2016. And, starting this month, we are excited to announce an expansion to our app alliance to outdoor retailer stores across Europe and the United States. 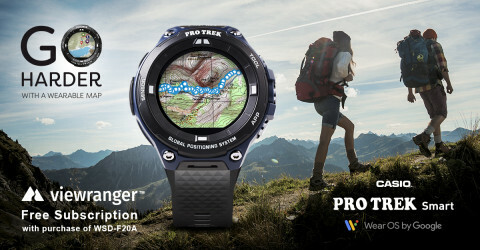 In the USA, ViewRanger now comes bundled with the new Casio Pro Trek Smart WSD-F20A at REI stores. This combo package includes our award-winning app and one-year access to USA maps for all 50 states. Explorers can view our blend of USA outdoor maps in four styles on the Casio smartwatch, as well as on their smartphones and tablets. We also continue to optimize our app features, maps, and trail content to work seamlessly with Casio's outdoor-ready smartwatches which now run on Wear OS by Google.